Agastache seedlings can be damaged by spring frost, but established plants often survive winter in climates where the soil does not freeze. Cabbage, Grape Vine, Mint and Echinacea. The tall, arching flower spikes of agastache contrast beautifully with shorter, mound-forming flowers like alyssum or petunias. 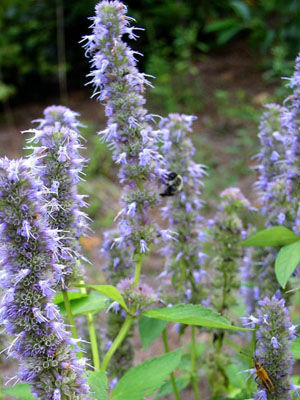 Agastache attracts bees and other beneficial insects. Set out stocky seedlings in late spring. Small agastache plants grow slowly at first, and gain size and bloom in late summer. Agastache tolerates summer drought better than many other flowers. Popular cultivars like ‘Blue Fortune’ are hardy to 5F (-15C) when well established. Some varieties bloom rose-red or orange. As flower spikes fade, trim them off with scissors or pruning shears. Agastache has few pest problems and is seldom eaten by deer. Heavy winter mulching can cause the dormant plants to rot.